Clocking Off is a mission in The Ballad of Gay Tony. The mission begins with Luis meeting Henrique and Armando at his Mom's house. 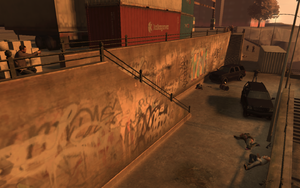 Luis then takes his friends to a pier in Bohan, where they need to oversee a business deal - a shipment of heroin that is being carried into Liberty City. A few minutes after arriving at the place, a rival gang shows up and a shootout takes place. After the fight is over, Luis, Henrique, and Armando take what they can of the shipment to a garage in Northwood, and the mission is over. There's a unique black Reefer seen in this mission. But it can't be obtained. The rival gang appeared in this mission is the Irish Mob. Strangely, the Irish Mob does not appear with their gang car, Oracle but instead the gang variant of Patriot. Clocking Off (100% Complete) mission on Youtube. This page was last modified on 24 September 2014, at 02:14.